Happy Birthday Cupcakes, give your little one this sweet treat! This is triple layers of fun all wrapped into one. The bottom layer is a 2.25" chocolate brown ribbon layered with a pink 1.5" grosgrain ribbon. 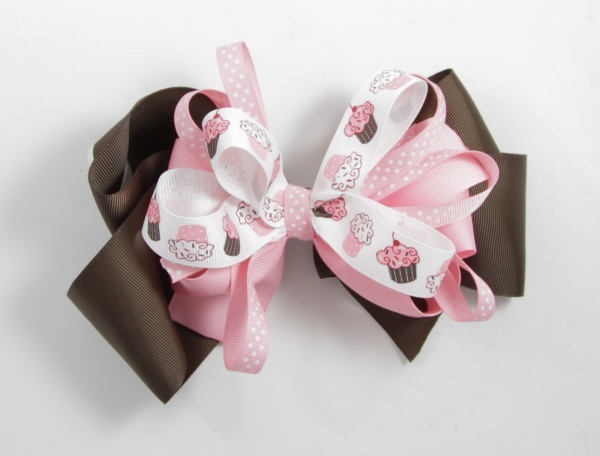 Then a 3.8" pink with white polka dots ribbon sprinkles the bow for a delightful treat. The top layer is a 7/8" grosgrain ribbon that has pink and brown rows of cupcakes decorated with colorful sprinkles and cherries too. The polka dots wrap the center and it is attached to a French clip. Say Happy Birthday to your special little one with this great Birthday Cupcake Bow.